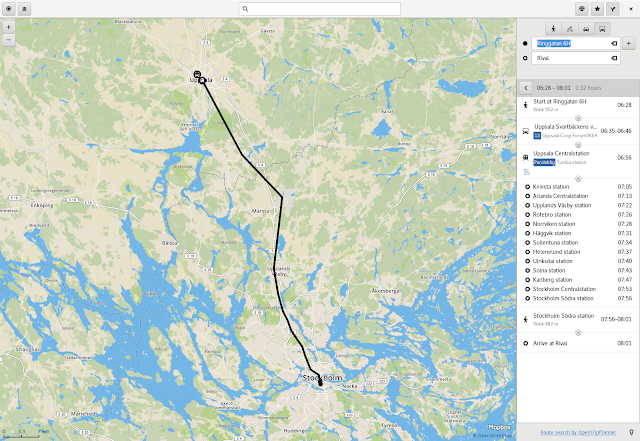 So, I promised an update on the transit routing a while back. Here I have entered the time a which I would at the latest want to arrive and entered the start and destination, so I've gotten some alternatives. Notice how now the trips are ordered by arrival time, and in reverse time order (so to speak). This was a behavior that one of Andreas' test panel persons commented on: ”This is different from Google, but I actually like it better this way!“. I have now selected a trip that is among the fastest (and has fewer changes). 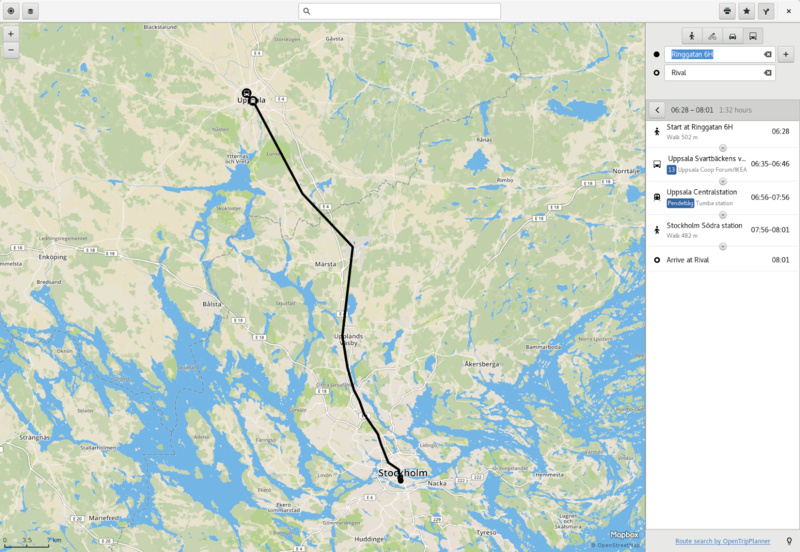 Clicking on the little expand reavler button on a leg of the trip shows the intermediate stops the train makes on the way. This is especially useful when your a bit unsure where to get off so that you can make a note of the stop just before (I well know this already in this case, though). And clicking on the last section of walking to the destination will zoom in to this part of the map. 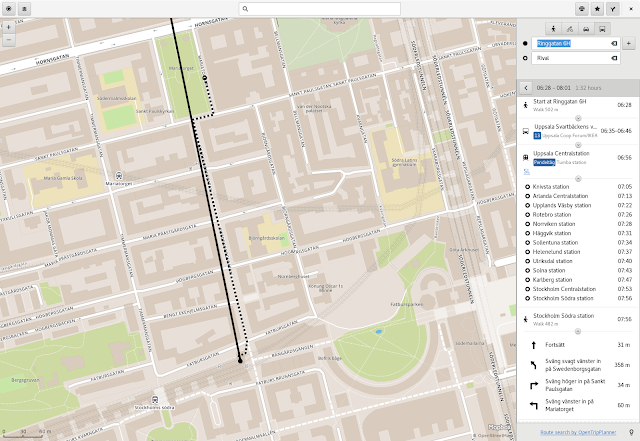 Now I used the export functionallity to save down the map view to my phone (currently there's a little bug in libchamplain where the path layers aren't exported along, but thankfully Marius have made a patch for it). Speaking of exporting, since last time I have also made the print button only show up when selecting a particular trip. However, currently the print layout implementation for this mode is only stubbed out and just shows a header with the start and destination names. Hopefully Andreas' will get around to cook up some nice mockups for that soon, bearing the same good quality as the ones used for rendering the sidebar itinerary views. This will also be useful, either to make an actual paper printout, or to export to i.e. PDF to view on a mobile device, for example. And that's pretty much what has happened since the last blog post in June on this subject that comes to my mind. 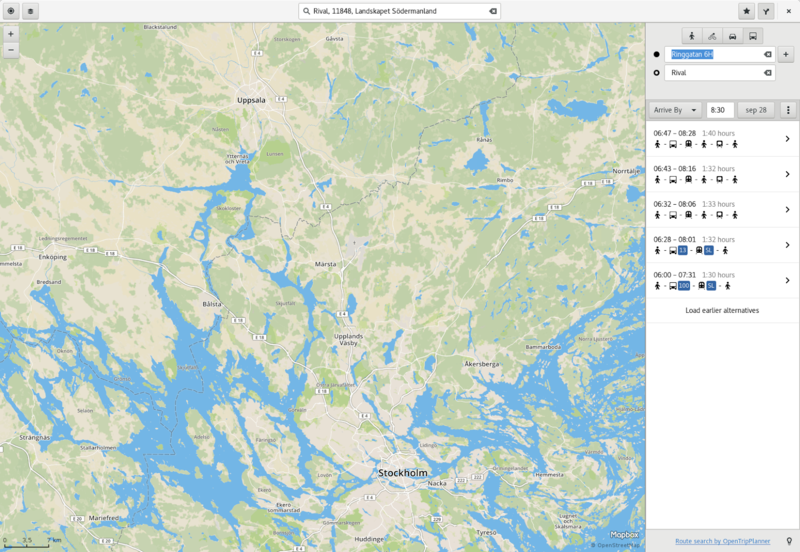 So, I just rolled the 3.21.92 release of GNOME Maps. This is final beta release before the next stable (3.22.0). The most noteworthy change will ofcourse be the new tile provider, replacing the discontinued MapQuest tiles, courtesy of Mapbox! We have also backported this to prior stable versions to keep things working in current distribution releases, and for the future we will also have the ability to swich tile sources without patching release versions, as Maps now fetches a service definition file. 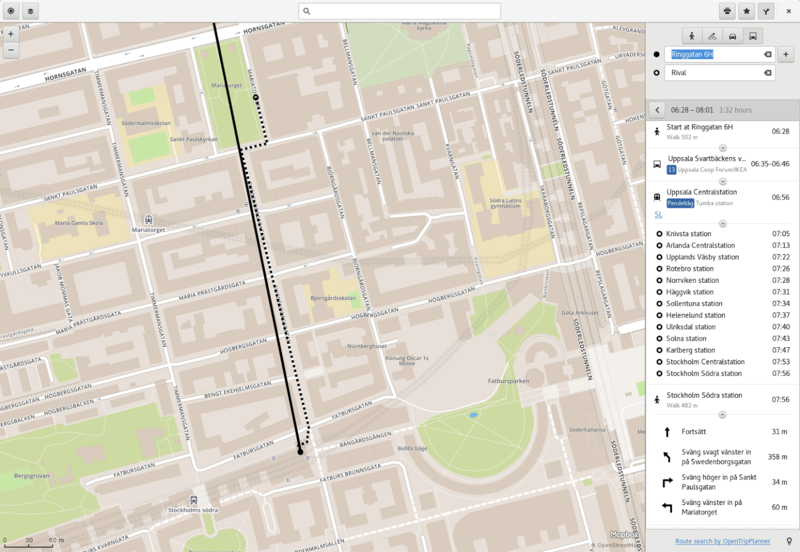 And maybe (if time and effort permits) we might expand into the territory of client-side rendering of vector data, which opens up some possibilties, such as rendering various layers of interesting stuff such as a specific type of point-of-interests, like "show all restaurants in this area". We still need somewhere and something to run our OpenTripPlanner instance on, and this summer getting basic tile service back on has ofcourse been prio one.